Timber Fencing is a great way to add a new look to your home or garden. 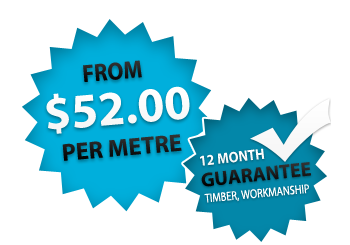 We build Melbourne's most popular timber fencing designs from the tough and long lasting Treated Pine Paling Fence, Timber Gates, through to features fences including Merbau Fences and Brush Fences. Paling Fences are the most traditional type of timber fence seen throughout Melbourne suburbs, offering the perfect solution for boundary dividing around the home that won't break the budget. Merbau Fences are an excellent choice when it comes to building a featured timber fence around the home. It is a versatile timber that works well with any style home. Picket Fences are available in many styles and designs, whether adding value you to your home or increasing privacy, picket fences are a true Australian classic. Cypress Pine Fences are a great choice when it comes to building a feature fence around the home with its light yellow tone and frequent dark brown knots. Brush Fencing is one of the most popular timber fencing designs in Melbourne suburbs. Assembled using Uncinata Melaleuca branches, brush fencing panels offer complete privacy & natural colouring. Woven Wire is a great choice when it comes to complimenting your garden, suiting homes of all architectural time periods. Gates are a great way to compliment any new timber fence, our range of gates are custom made to suit any purpose, from single swing gates through to electric sliding driveway gates. Screening has become a must when adding style to any home, guaranteed to add value and privacy, they are also a great solution for providing an excellent mix of sunlight, shade, and breeze.